I wouldn’t want to dress up as Crockett & Tubbs. 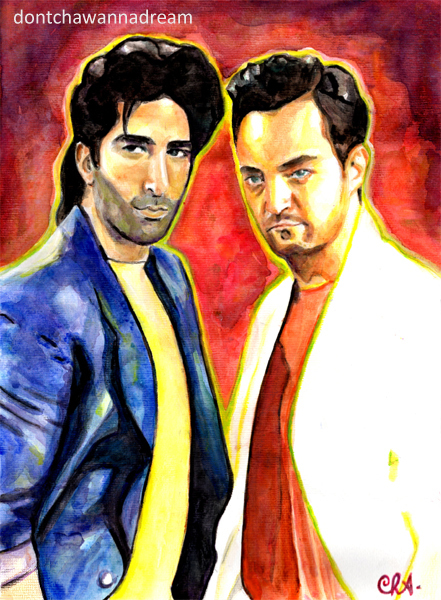 No… Ross & Chandler are WAYYY cooler! Beautiful portrait work as always, Cha! Great painting like usual! I would have never imagined those two as Crokett and Tubbs. And I remember Miami Vice from the original TV show. Actually, I know both shows that you’re referring to here. That must be a new record for me! It’s from the episode “The One with All the Thanksgivings”, season 5. Love Friends so much!!! Really? I didn’t know that. Your English is so good, no one would ever know it’s not your native language. Actually, they might. Your English is better than most native speakers. The Wombies all give your their highest recommendation. You can put that on any resume you want. I’m sure it would have a great influence on any prospective employer. Very Cute cha cha …..
You’re definitely the biggest Colin Farrell fan I know! ahah And I like that! 😀 Will make a portrait of him. Just for you! Yeah, I will!! Maybe not this month but I will. 😀 I never say no to a Colin Farrell fondant icing. Never!!! lol That’s awesome. Que pases una hermosa jornada. Wonderful portrait Cha, you do fabulous work – really like the rich palette used. Thank you, Mary!!! 🙂 SO glad you like this one. Gem is such a beautiful word by the way. Thanks so much for taking the time to comment and writing such lovely things, Andro!!! Great painting, Cha. Miami Vice, good TV series. I’m not sure if I could imagine with different actors! Have a great day. And come back soon with more drawings. Ahahah you know, I actually had to google “mullet”, so thank you! I learned a new English word today! Have a great day!! And thanks for your comment and visit. Thanks a lot, Sergio! The Spud-Nick costume was so awesome… You’re absolutely right. Well that wasn’t my idea but thank you, Kourt’!!! 🙂 Love FRIENDS.